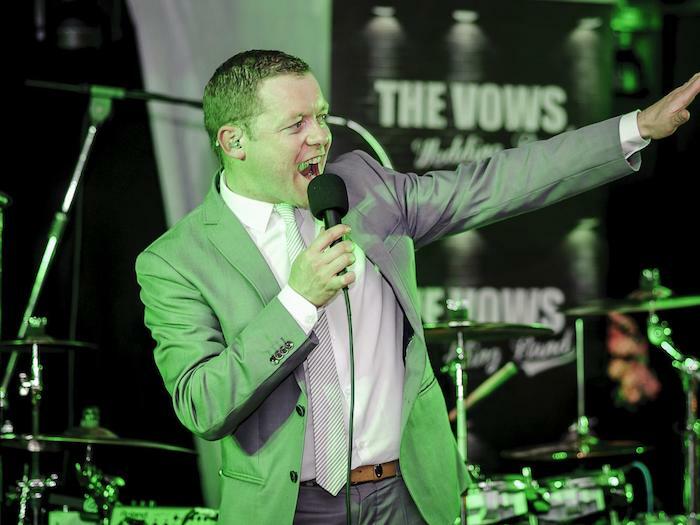 “The Vows band” has been at the pick of Ireland’s premier wedding bands for over ten years. A wedding band that stands out from the rest, a band that has something unique to offer and still caters to all your guests, young and not so young. It has come as no surprise that the music and entertainment of “The Vows” has become synonymous with adding to a perfect wedding day for you and your party. Lead singer, Damien Bowe, had been involved in the music business from an early age, forming a family band at the age of 15. Damien signed his first record deal in 2000 with Edel Records and went on sign for Warner Bros Music and Universal Music as part of the International pop act D-SIDE. Damien has already had three top ten pop singles in the U.K. charts and five top five singles in Ireland under his belt. This young but seasoned performer has also appeared on T.V. shows such as Top of the Pops, S.M.T.V., C.D.U.K., GMTV, Ireland AM, The Den, to name but a few. Damien recorded D-SIDE’s debut Album in Miami, Los Angles, Copanhagen and London with some of the biggest names in the business including Desmond Childs, Andy Hill, Cutfather and Jo to name but a few. We have the perfect option for you! You can review the options here. Special Requests can be catered for – please contact us here for all enquiries. Band and DJ for wedding reception. Music for the church -(various options available for your service), Band, and DJ for the reception. Music for the Church (various options available for your service), Band, DJ, and Irish Dancers for the reception. A: Firstly check availability, all dates can only be secured with a booking deposit. The deposit can be paid via bank transfer. A: Three hours which includes the break for the evening buffet. Q: What time do you start at? Q: How long does the DJ play for? A: The DJ will play from the time the band finishes to 2-2.30am depending on the hotel. Q: Can my family or friends get up to sing? A: Yes sure! As the band is fully live we can back good and not so good singers!